By Arthur V. Chadwick, Ph.D. In October of 1992, Spectrum Magazine ran an article written by a young physician, Gary Gilbert, in which he attempted to justify his loss of faith on the basis of the existence of pseudogenes. Pseudogenes are regions of DNA that have codes very similar to known genes, but often have stop codes in every reading frame, so that no protein could ever be produced from the code they contain. They were presumed by evolutionists to be copies of protein-coding genes that, through the process of evolution, have been mutated so extensively that they are no longer functional. Gilbert learned that there was a pseudogene within the five functional genes of the beta globin gene family on chromosome 11 that was present in both humans and chimpanzees. Since the likelihood of a functional gene being similarly disabled in both humans and chimpanzees is very low, Gilbert concluded, in his Spectrum article, that both humans and chimpanzees were descended from a common ancestor that had that pseudogene. Gilbert decided, on that basis, that the Biblical account of origins could not be correct and therefore concluded that we humans arose as a result result of evolutionary processes. Of course, this was a huge stretch, but it was enough for Gilbert; and his article was the basis for a number of Adventists losing their sense of direction in scripture, especially with regard to origins. For decades, I have explained to students in molecular biology that pseudogenes are not functionless and never were. In the case of the beta globin gene, I pointed out to them that the two pseudogenes in the beta globin gene family (there are five globin genes which occur on the chromosome in the same order as they are utilized in the developmental process) are so placed that one of them is located just before the genes that are activated in ontogeny (at the beginning of fetal development), and the other one is located just before the two beta globin genes that are utilized in the adult. That was, for me anyway, clear evidence for regulatory functionality. So, I instructed my students to this concept. In philosophy class, I handed out or at times gave, as part of the final exam, Gilbert’s article as required reading for my students. I required them to analyze his logic and conclusions. Almost always the students concluded that Gilbert was not coming to the data to find answers, but he was seeking to use science to support his own pre-determined philosophical position. Finally, within the last year, the hemoglobin pseudogenes have themselves been the object of some study, specifically the HPPB1 gene that sits amidst the “functional” genes of the beta globin locus. As we had suspected on the basis of a considered study of placement, it is not only highly conserved (something Gilbert could have seen early on), but is essential for function. Even a single base change in the pseudogene region is responsible for pathology in humans (6). What is the take home lesson from this? When we think we find evidence that a clear reading of the Bible story of origins is wrong, it would be well to consider the mantra of the skeptic: “An extraordinary claim requires extraordinary evidence.” Before you decide God was wrong when He wrote with his finger in stone (7) that he made the earth in six days, perhaps we would be well served to consider all the evidence, and then, with humility, acknowledge our own ignorance and bow before the Creator in reverence and awe. Who knows, had the author of this article reserved judgment, or better yet, had he pursued the functionality of the pseudogene, perhaps we could be talking about the Adventist Nobel Laureate who discovered the functionality of pseudogenes? – instead of lamenting for a soul who chose to abandon the Biblical account of origins to follow the philosophies of Darwinism. 4. Yan-Zi Wen, Ling-Ling Zheng, Liang-Hu Qu, Francisco J. Ayala and Zhao-Rong Lun. 2012. RNA Biology 9:1, 27–32. 5. Moleirinho A, Seixas S, Lopes AM, Bento C, Prata MJ, Amorim A. 2013. Evolutionary Constraints in the β-Globin Cluster: The Signature of Purifying Selection at the δ-Globin (HBD) Locus and its Role in Developmental Gene Regulation. Genome Biology and Evolution. 5: 559–571. 6. Giannopoulou E, Bartsakoulia M, Tafrali C, Kourakli A, Poulas K, Stavrou EF, Papachatzopoulou A, Georgitsi M, Patrinos GP. 2012. A Single Nucleotide Polymorphism in the HBBP1 Gene in the Human β-Globin Locus is Associated with a Mild β-Thalassemia Disease Phenotype. Hemoglobin. 36 (5): 433-445. Sean&#032Pitman: Note also that true science is also “spiritually discerned” as well. All truth is God’s truth. The ability to think rationally, to think scientifically, is a gift of God where we think God’s thoughts after Him – as Newton pointed out. Without the guidance of the Spirit of God, valid science would also be impossible. This is as fideist an argument as one can profer. Hardly. Once one realizes that the evidence points toward the existence of a personal God, it isn’t much of a leap of logic to conclude that God designed us to find Him – that He is the source of all of our abilities – to include our ability to reason from cause to effect and from effect to likely cause. Compare this to the fideist position that proposes that God does not want us to use our God-given abilities to think and reason as a basis for finding Him or discovering His Word… that human reason is always suspect and is always trumped by a form of faith that requires no rational support or empirical evidence. George: In my very long life i’ve heard, seen and read about a lot of fellers, and a few gals, sayiing they are in touch with God or are appointed ones. What kind of empirical test would you suggest to seperate the wheat from the chaff?. I’m afraid if is based on eye witness accounts of fellers with a vested interest in the outcome, albeit martyrdom, you may have some genuine competition as to who wears divine robes. To Sean, virtually anything can be empirical evidence. David&#032Read: Why is it okay for mainstream science to twist facts to fit its theories but not for creationist to construe and interpret the data of nature in accordance with revealed truth? It’s not okay. I haven’t defended it. Extremists on both sides are wrong. You have no clue what you are talking about. I do research that has absolutely nothing to do with origins. I publish science in professional journals that would reject my papers if I wrote, “Oh, by the way, God created this species 6,000 years ago.” The other part of my work at a private Christian institution is teaching, and I share my relationship with Jesus daily. What could you possibly know about that when you have never met me, seen me at work, or know anything about my work? I think you’re a poor judge of character. Kent makes it sound like David is referring to some wild extreme twisting, when he is simply referring to the basic tenets of evolution, which we all know Kent does defend. Professor Kent, can you explain this discrepancy? Then why are you constantly on this site arguing against the biblical view of origins and in favor of the atheistic view? If you don’t even have a professional stake in the issue, why is it so important to you to constantly argue that the biblical view of origins must be believed by faith alone, without any support from reason or evidence, and that all of the scientific evidence supports the atheistic view of origins? If you were curious about Creationism instead of intent on ridiculing it, you’d know that creationists don’t think God created “species” six thousand years ago, but types of animals that Adventist scientist Frank Lewis Marsh called Baramin. Since the Flood, each baramin has diversified into many different species. This is a concept that has been endorsed by Harvard Ph.D paleontologist Kurt Wise and other extremely well qualified scientists. But you’re more interested in ridiculing creationism than even trying to understand it. And frankly, I don’t think there’s any good excuse for Christian, much less Seventh-day Adventist, scientists providing content for journals run by anti-Christian, anti-Biblical bigots. If the Ku Klux Klan wanted you to publish in their journal, would you do it? Then why do you provide content for journals bigoted against theism and creationism? What Jesus do you think you have a relationship with? The Jesus of the Bible is the Creator God. (Jn. 1:3; Heb. 1:2) Do you think He created by predation and death and disease over the course of 600 million years? The Jesus of the Bible is the second Adam who succeeded where the First Adam failed. (1 Cor. 15:22; Rom. 5:12-21) If there was no actual Adam and Eve, and in the mainstream origins narrative there certainly is not, how can Christ have been the second Adam? The Jesus of the Bible spoke of the creation and the Flood as literal events. (Mat. 19:4; 24:38-39) Was Jesus wrong about this, or did He simply lie to his listeners to make a point? And of course, Jesus came to die for and redeem fallen humanity, but in the mainstream view of origins there absolutely has been no fall whatsoever. To the contrary, there has been an astonishing rise from amoeba to Mozart, from slime to Einstein. There certainly is no need whatsoever of a redeemer. Darwinism makes absolute nonsense out of Christ’s identity and mission on earth, and out of Christianity. You can’t be an evolutionist and be a Christian. They do not go together. So again, what Jesus do you think you have a relationship with? Besides advertising you ignorance of the process of scientific communication I suspect you have not thought this one through. Or are you just using the time honoured legal practice of creating reasonable doubt or perhaps a Chewbacca defense which outside legal desperation is favoured at times by Sean himself. I presume you say this about law as well. Do you think that an Adventist should write for a law journal for I suspect that most law journals would be run by atheistic or agnostic people who do not accept literal creationism? Why do you pedal your book through a company run by a man Jeff Bezos who is an atheist who recently donated 2.5 million dollars to support gay marriage. Be consistent otherwise I will be confirmed in my thinking that you are all hat and no cattle as they say in your home state. @Pauluc: Paul, whatever Jeff Bezos personally believes, he allows all comers to sell through Amazon, including many thousands of Bibles and religiously-oriented books. If Bezos didn’t allow religious books to be marketed on Amazon, I wouldn’t write a secular book and sell it on Amazon. What Jeff Kent is saying (and it is true) is that the journals he publishes in are not open to creationists; they will not publish material with a creationist point of view. I think that raises an ethical issue of whether creationists should even be supporting that type of journal, when there are at least three different peer-reviewed creationists journals in existence. By the way, law reviews certainly do allow articles on jurisprudence that discuss issues such as positive law or man-made law as opposed to theories of natural law, or a higher source of law. Certainly, the founders of the United States believed in a higher source of law: “We hold these truths to be self-evident, that all men are created equal and are endowed by their Creator with certain inalienable rights, and that among these are the rights to life, liberty, and the pursuit of happiness.” Hence, any discussion of the jurisprudence of the founders will necessarily note that they believed in principles of law and justice that were more than merely human, and above, and a corrector of, merely human statutes and decrees. @David Read:”What Jesus do you think you have a relationship with? The Jesus of the Bible is the Creator God. (Jn. 1:3; Heb. 1:2) Do you think He created by predation and death and disease over the course of 600 million years? The Jesus of the Bible is the second Adam who succeeded where the First Adam failed. (1 Cor. 15:22; Rom. 5:12-21) If there was no actual Adam and Eve, and in the mainstream origins narrative there certainly is not, how can Christ have been the second Adam? The Jesus of the Bible spoke of the creation and the Flood as literal events. (Mat. 19:4; 24:38-39) Was Jesus wrong about this, or did He simply lie to his listeners to make a point? David, You said it so well, I could not resist the temptation of quoting you on this. My hope is that Professor Kent will read it several times until he realizes the truth contained therein! There are many people who take Sean Pitman’s approach toward “potentially falsifiable empirical evidence” and find the “weight” of evidence lacking. They look at the multitude of claims in scripture that violate all laws of nature and say, “look, these are physically impossible; this is a fairy tale.” These are supernatural claims like forming a living breathing organism from dirt; tapping a rock with a stick so that water rushes out; the sun standing still for hours; throwing a stick in water and seeing an axe head float; curing a leper with a voice command; a virgin woman giving birth; a three-day-old human body returning to life. I could go on and on. There are thousands of similarly fantastic stories told throughout the history of mankind, and they continue to this day. To believe ANY of them is to set aside one’s reliance on “potentially falsifiable empirical evidence” and say, “hey, I don’t understand it, but I am going to believe in it even though it is demonstrably false by the methods of naturalistic science.” We all pick and choose what we believe; we all look to evidence; but when we believe in something that science demonstrates to be physically impossible, one is obviously deceived to continue claiming their beliefs are “superior” because they’re based on scientific evidence. For you guys to claim that your beliefs are upheld by the “weight” of “potentially falsifiable empirical evidence” is an outright lie. You guys (and I) believe in things that science makes 99.999999999999% clear are physically impossible. You have your “evidence” to believe, just as I do, but you’re too arrogant to admit the evidence is something VERY different from the glaring and unforgiving light of science. VERY DIFFERENT. It is NOT based on science. Sean claims he would give up his beliefs if science convinced him that life could not have been on this planet for only a few thousand years. Yet he holds steadfastly to his beliefs even though science has shown convincingly that his belief in so many other things, including the resurrection of Lazarus and Jesus, were scientifically untenable and could not have physically happened. This simply demonstrates his idiosynchratic choices and heterodox theology based largely on his peculiar obsession with one issue and the recognition he craves for being an “authority” on it. You do believe that such supernatural events did really happen. Do you hold such beliefs as a result of evidence or the lack of evidence? 1. If evidence, then can you describe it? 2. If lack of evidence, then is not your faith blind? Finally, was the faith ot the disciples and followers of Jesus Christ based on evidence or the lack of evidence? @Professor Kent: I will just take the first of your list of things that are “physically impossible”. I agree it is physically impossible to form a living breathing organism from dirt, IF there is no God in the vicinity. But how is it physically impossible if God is there? That’s not now science works. There are many hypothesis in science that have very high predictive value without anyone knowing why or how the phenomenon in question actually works. As I’ve explained to you before, the resurrection of the dead is not scientifically impossible or untenable. There’s no scientific reason to say that, given someone with enough knowledge and creative power, especially someone with evident access to Divine Power or God-like power, that a body still could not be raised from the dead. To the contrary. The weight of empirical evidence in hand suggests that it did actually happen. Just because one cannot demonstrate how it happened does not mean that it did happen or that the hypothesis that it did happen isn’t scientifically supported or otherwise empirically rational. The same is true for the origin of the universe. The artifactual nature of the universe is clearly evident, even for most physicists who see a Divine or God-like signature behind the fundamental laws of nature, without knowing how it was or could be done. Still, the design hypotheses for these artifacts is quite clearly supported. Amen! Jesus is alive. This Kent will not deny; which means that Kent’s naturalistic approach is not worth a dime for discovering the truth! What’s the point of trying to demonstrate that the resurrection is impossible if you believe that it is possible because it did actually happen? The resurrection of Jesus could have been falsified by Jesus contemporaries by simply producing the dead body of Jesus. They didn’t to this, and didn’t even try! Case closed, Kent! Give up your worthless philosophy based on human wisdom! @Nic Samojluk: You wrote, “The resurrection of Jesus could have been falsified by Jesus contemporaries by simply producing the dead body of Jesus. You are correct about the possibility of falsification. But do we know they didn’t try? There is no evidence that they tried! Some of them had witnessed the resurrection of Lazarus. My guess is that they felt no need to find out the truth because Jesus had provided ample evidence that he had power over nature and death itself. Actually, the Roman guard also witnessed the Resurrection of Jesus as well. There was no need for further investigation. They already knew, first hand, the truth of the disciples’ claims. Bob&#032Helm: I never called anyone angry. I affirm you as my brother in Christ, even if we don’t always agree! George&#032Evans: I find that hard to believe because the person who designed it said he did it about 6,000 years ago. And He doesn’t lie. Show me a quote where God said this. You know very well that the Bible is quite clear about the recent creation of all life on this planet – as is Ellen White. While an exact date is not given, it is fairly easy to figure out the relative span of time for the existence of life on this planet. Be still, and know that I am God!! When we talk to Jesus every day, when we get to know Him on a personal basis, really get to know Him, when He becomes our very best Friend, it is very, very hard to understand how another human being could not see and accept the 6 day literal Creation fully and completely. When we see how scripture has been proven through the finds in archeology, through the events in history that years before had been predicted, I have to ask myself, “Why all this chatter?” But then I have to remind myself that not everyone has that kind of relationship with our Lord. For those of you who do, I am richly blessed by your words and comments. for those of you who do not know Christ, I feel a very deep sorrow. Pseudogenes were created for a very specific reason. And some day, we will all understand the whole plan of DNA. What a wonderful God we serve!!!!! You have stated a great truth, I believe! According to the “devolution” theory that Sean Pitman advocates and other creationists espouse, the DNA of longer-lived organisms has long been and continues to be rendered “junk” by the rapid accumulation of deleterious mutations. So which is it? (1) Selection changes DNA to yield functional improvements over time? Selection continually maintains the function of DNA, including duplicate sections thought to be unnecessary or degraded by mutations? Selection cannot overcome deleterious mutations so that much of DNA over time loses information and function? You have a good grasp of “truth,” Nic, so which is it? Remember what Dr. Sanford said in his Loma Lecture about junk DNA. You seem to be ignoring the fact that the weight of evidence seem to suggest that much of what recently was thought to be junk DNA is no longer considered to be useless. Dr. Paul Giem reported in a Loma Linda lecture that the percentage of useless DNA has been decreasing at an alarming rate to the surprise of and disappointment of evolutionists! As I’ve already explained in response to this very same argument of yours in a note above, living things haven’t existed very long on this planet – only a few hundred human generations is all. Consider also that if the majority of the human genome were in fact non-functional, we’d all be dead. That is why the significant majority of the human genome is still function while still inevitably degenerating over time. True non-functional pseudogenes are relatively rare. And, when they are highly conserved between different species, that is a big clue that they are in fact functionally beneficial. Sean I’m afraid if you actually looked at the data on the comparative genomics of the globin genes you would perhaps appreciate that both Arts and your defence of the functional importance of pseudogenes is completely specious. It looks to me and most scientist like the chance and contingency represents the best assessment of most of the genomic structure. and follow up the original literature that is referenced there if you believe scientists are lying about the details of the genomic structure. 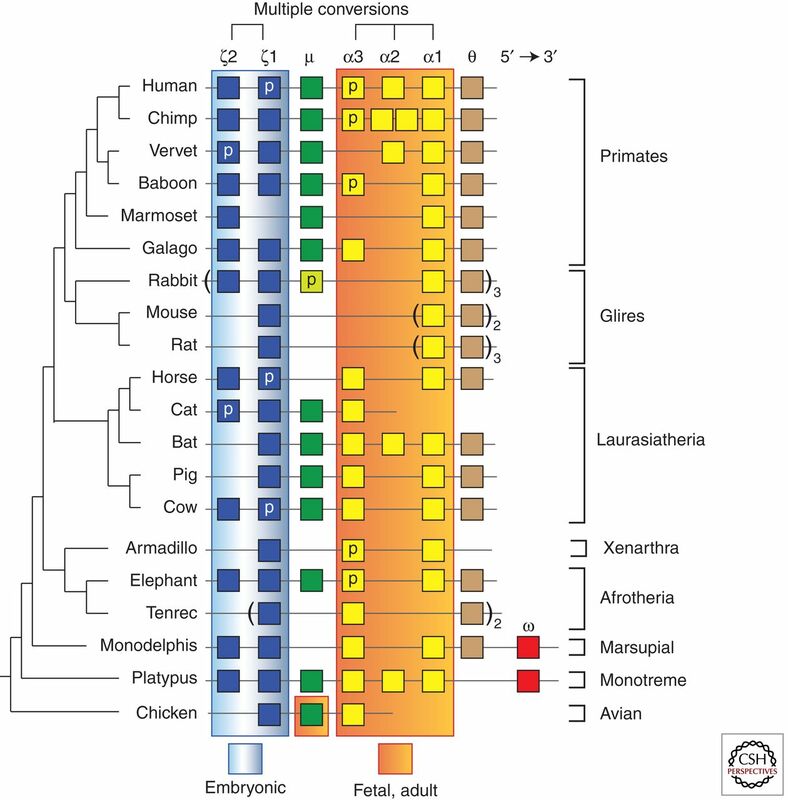 2] Why do the primates share this pseudo gene and not the other mammalian species? and answer a few simple questions. 4] Why are there different gene copy numbers between the different species but very similar pattern of pseudogenes and structure in higher primates? 5] If the function of pseudogenes are at all important why are there none in platypus or bat that have 6 alpha/4 beta and 6 alpha/2 beta respectively. 6] Across the species examined almost all the homologs have pseudogenes in some species of other. 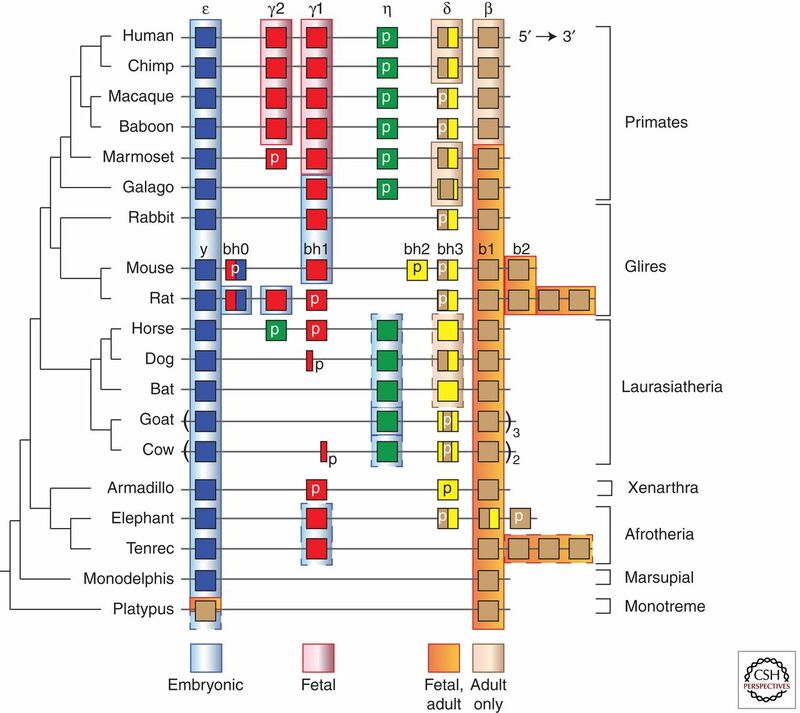 7] If you look at figure 4 you will see that the progression of beta gene expression through life is seen with greatest complexity in primates and humans but is not a feature of marsupials or monotremes monotremes where only embyronic and fetal/adult forms of the beta and alpha components of haemoglobin is produced. I conclude that as you are want to do you use an exception to argue your case. What are the other pseudogenes that you predict by your model of origins that are functionally critical and designed. Enough with the hand waving some specificity is needed. Because, as I’ve already pointed out, non-coding DNA is more important than coding DNA. Proteins are like the basic bricks and mortar for building a house. Non-coding DNA is the blueprint that dictates how the basic bricks and mortar are to be used – what type of house to build. Again, as I’ve already explained, just because every creature doesn’t share the same functionality doesn’t mean that functional sequences aren’t beneficial in the creatures they’re in. Just because you can live without your legs or arms doesn’t mean that they’re not important to you. So what? Lots of systems have homolog components. That has nothing to do with explaining the novel functional differences beyond very low levels of functional complexity. In human design it has more to do with conservation of design when building similar systems with similar structural and functional needs. 7] If you look at figure 4 you will see that the progression of beta gene expression through life is seen with greatest complexity in primates and humans but is not a feature of marsupials or monotremes where only embyronic and fetal/adult forms of the beta and alpha components of haemoglobin is produced. Again, so what? This says nothing about the enhanced functionality of the primate system and does not speak speak against the argument that only intelligent design could have produced these enhancements – unless you can actually come up with a statistically viable mechanism. Of course, you haven’t done this. You admittedly have no idea how RM/NS can produce much of anything beyond very low levels of functional complexity. You just have faith, blind faith, that somehow someway, it must have happened. It’s not testable in a falsifiable manner and it is not demonstrable either. Again, that’s not science. That’s blind faith philosophy – a form of blind faith religion. You’re completely ignoring the other reasons for its importance and overall functionality and the reason why it is so heavily conserved by natural selection. The beta pseudogenes appear to have only a limited job for a very limited time. This does not mean, however, that their function is therefore non-beneficial or unimportant. Sean&#032Pitman: This isn’t true. If prophecies could be easily interpreted to mean vastly different things, they wouldn’t be useful as a basis for rational faith. It is precisely because they are open to the very real possibility of falsification that they form a very solid evidentiary basis for faith. Again, many Christians arrive at different conclusions regarding what is prophesized. And you think this has nothing to do with different interpretations? This is in large part why much of the secular world thinks Christians are nuts who argue endlessly and can’t agree on much of anything. Get real. It’s no different with science. Many scientists also argue endlessly over the correct interpretation of the evidence. I’m just saying that for me it is clear and that many come to other interpretations because of personal desires or philosophical motivations – not because of what the evidence is clearly suggesting. Ultimately, however, each individual must answer for him or herself. That is why the evidence must be considered on a personal basis. No one else can answer for you. You must do your own searching and weighing of the evidence. David&#032Read: The issue of the day, the question that demands an answer, is: should scientists at SDA colleges do and teach science from an atheistic perspective or from a biblical perspective? Jeff Kent, Paul Cameron and a few others have argued that it has to be done from an atheistic perspective, and that’s essentially the only way it can be done. I have not argued for this at all, David. Stop attributing things to me that are untrue. I’m much closer to Lee Greer’s perspective that science should be taught as science, not religion. I think Pauluc is the same. Yet while I am not an SDA Church employee, I absolutely DO teach a biblical perspective in my classes. When I lecture on material in a textbook that presents an evolutionary perspective, I’m quick to add that the student can believe as they wish, and that I don’t subscribe to the textbook’s perspective. I know it’s a lot more fun to make Professor Kent into a monster, but when you do so, you guys make clear that if you jump to unwarranted conclusions about me, you’re doing the same with scientific evidence. Anyway, I really should stop letting you bait me like this. I think we’ve beat this fideistic horse to death at this point. @Sean Pitman: No, I do not speak this way at all to my students. I’m not baiting you; I’m responding to David. You’re being sarcastic and disrespectful, and you’re completely misrepresenting my position. I am not misrepresenting your position or being sarcastic. I’m presenting the arguments you’ve repeated over and over again in this an other forums for quite some time now. You don’t believe that valid faith and science are essentially the same thing. You don’t believe that faith is dependent upon the weight of empirical evidence or scientific arguments nor is it subject to the potential for falsification given certain forms of empirical evidence. You believe that faith can consider evidence, but need not be influenced by it or overcome by it or changed by it. You’ve made yourself very very clear in this regard – for me and pretty much everyone else who’s followed your posts for any length of time. Jeff, Lee Greer teaches that humans and apes descended from a common ancestor. (Louie Bishop gave Greer’s lecture slides to Educate Truth). If you’re closer to Lee Greer’s perspective, then you’re a Darwinist, not a creationist. You seem to be saying that while you personally believe in Bible history, you think that science should continue to be done pursuant to atheistic assumptions and rules. I keep asking you why that’s okay, and you keep avoiding the question. Because when I phrase the question as “why do you think it is okay for Christians to do science pursuant to the assumption that God has never created or intervened in the material universe,” you realize that your position is indefensible, and you have nothing but your inane invasions to fall back on. And my question to you remains the same: Why do you think this is okay? Why do you think it is okay for Christians to devote their lives, in effect, to building up the apologetical structures of atheism? Can you now attempt to answer that question without inane evasions about what you personally do? Dude, I don’t know of a single SDA scientist whose professional work truly touches on the area of origins. And I would agree with you wholeheartedly that an SDA-employed scientist should never promote the view that the world was accidentally self-created. I don’t think doing so would be okay. I’m not giving you inane evasions. I’m responding forthrightly to your questions that follow from totally, completely, ridiculously inane assumptions about my beliefs and what I have supported here at Educate Truth. You guys manufacture some pretty amazing stuff, which is all the more amazing because you actually seem to believe it. You turn absence of evidence into remarkable convictions about minute details regarding my belief system and integrity! @Professor Kent: My simple mind can understand David’s point, certainly yours should. You do research. You publish this research in a journal that purposely excludes design. Therefore you are helping them make money and are an accomplice in a crime against the Creator. @Professor Kent: Leaving aside the issue of publishing in journals that disallow discussion of creation or design (which George is responding to), my concern is that believing scientists not endorse Darwinism. And since you’re saying, Jeff, that “I would agree with you wholeheartedly that an SDA-employed scientist should never promote the view that the world was accidentally self-created. I don’t think doing so would be okay” are you thereby saying that we should not hire any Darwinist professors? If that’s what you’re saying, then I agree with you, and wonder why you’re so hostile to this website. You now seem to be agreeing with me that SDA institutions should not hire Darwinist professors, nor allow Darwinism to be taught as truth, and you’ve repeatedly said that you yourself are not an evolutionist. So I am left to wonder why you so passionately defend La Sierra? Bob&#032Helm: When intelligent young people are presented with such drivel in the name of Christianity, it’s no wonder they walk away in droves. The research is crystal clear: people walk away from Church in droves not because of theology or ideology, but largely because of relationships and experiences. There are all kinds of reasons why young people leave the church. The undeniable fact is that one very big reason is that religion no longer makes sense when the claims of the Bible are said to be completely inconsistent and at odds with the claims of modern science. It becomes clearly irrational for many well-educated young people to remain in a place that is intellectually inconsistent with what they believe to be reality – the “real world”. They want to be honest with themselves and step out of what they consider to be a fantasy world for the “ignorant, stupid, or insane”. Sean you may be right but the problem is that the religious right equates fundamentalism with Christianity and that makes a very brittle Christianity as you yourself have articulated with your “If I ever…” statement. It is very difficult for people indoctrinated with the meme of Christianity is only ever Fundamentalist Christianity to move beyond this when they encounter evidence against a literalist reading scripture. Many people don’t see the same value in social Christianity or ethical Christianity. If the Bible is nothing more than a bunch of moral fables, what’s the point pretending that Jesus was anything more than a lovable crazy man who thought he was God? Certainly this view isn’t something for which most would be willing to put their lives on the line. Why then are you here? It seems to me that you are here arguing with me because your only real beef is with those who claim that there is actually a rational basis for faith and belief in God and particular interpretations of the Bible as the Word of God that are generally accessible – since the same evidence and rational basis for considering it is generally available outside of one’s own mind and personal experience. You do not argue against Jeff Kent, even though his faith informs him of truths that are very different, fundamentally different and opposed to those derived from your faith. Why don’t you argue with him? Because, you don’t care about his faith and how it is fundamentally opposed to yours, because he claims no evidence, no generally accessible empirical evidence, for his faith. He is not claiming the ability to rationally challenge your faith position. That’s why you really don’t care what he believes. You’re only opposed to those who claim that there is a rational, potentially falsifiable, basis for certain views of God and certain views of the Bible and what are and are not valid interpretations of Scripture given the information that is currently in hand (i.e., “present truth”). That’s what really gets your goat… but that is the type of Christianity that the Bible itself promotes. @Pauluc: Paul, those two tablets of stone written on by the finger of God are very brittle, as Moses found out. If life has been here over 6,000 years, someone’s lying. Sean&#032Pitman: I am not misrepresenting your position or being sarcastic. I’m presenting arguments you’ve repeated over and over again in this an other forums for quite some time now. Any rational and obective reader would recognize your repeated attempts to summarize my position in the most exaggerated and unflattering light possible. You restate my alleged positions over and over and over and over. That’s your argumentative style. If there are any rants posted here, it’s your long-winded and terse descriptions of my beliefs, and your spirited assertions that you surely understand me–and all things science–much better than I do. I think you get upset most when I point out that you prioritize the evidence of atheistic scientists above the inspired authors of scripture, which has nothing at all to do with my beliefs. You continue to make your case for science and reason, but wish to change the topic because you fear that others might also identify your theology as heterodox. You’re acting very edgy. Of course, this is your website, so if you’re uncomfortable defending your beliefs and want to cut me off by complaining about mine, it’s certainly your privelege. I’ve already explained my position, many times, and addressed these very same points that you bring up, yet again, in this very same thread. I’ve “defended my beliefs” quite clearly I think. I simply see no reason to keep going around and around in circles on this very same topic saying the very same things over and over again. And I do sincerely wish you all the best and may God bless you and yours with health, long life, and abundant joy in the knowledge of God’s love. All I have stated is that the Holy Spirit can convict us that God is real and that His word can be trusted. If you think a force that can move mountains is unable to move one’s mind, you’re entitled to that. God created the human mind for a reason, and He expects us to use it to discover Him through the things that have been made (Romans 1:20) and the evidence that He has already provided to us that are within our reasoning powers to grasp. He does not trump the mind or our own human efforts to search out and weigh the evidence provided. He does not force our conclusions independent of our rational abilities to understand based on “the weight of evidence”. @Sean Pitman: I totally agree. George&#032Evans: Kent makes it sound like David is referring to some wild extreme twisting, when he is simply referring to the basic tenets of evolution, which we all know Kent does defend. The only discrepancy is in your imagination. I’ve never defended the basic tenets of evolutionism: abiogenesis and common ancestry for all life forms. I reject them outright, and have stated hundreds of times at this website that I’m a creationist. Stop making uninformed assumptions. Pay attention. You do claim to be a creationist, but based strictly on a type of faith that requires no basis at all in empirical evidence. This allows you to argue like an evolutionist while still claiming to be a creationist. You always sound very much like an evolutionist, more ardent than many atheists that I’ve debated. You even appear to get angry when any empirical evidence, from biology or geology/fossils, is presented in support of the Biblical perspective. It’s like you’re trying to have your cake and eat it too. Pick your side and actually defend it with something besides wishful thinking already. Testing God’s existence is not a valid position of science. You simply cannot verify a historic event because you can’t replay it. There are many ways to verify historical events to very useful degrees of predictive value. If there were no such ways, then there would be no valid historical sciences. There’d be no way to tell if Abraham Lincoln was in fact a historical figure or if the Civil War did in fact happen as described. I’m sorry, but the study of history can in fact be based on valid scientific methodologies and empirical evidence. Therefore Sean is right. If you can’t test God’s existence scientifically, then you can’t reject His existence scientifically. This has become a stupid conversation that gets more stupid with each stupid post. I can’t believe I’m even responding to anyone who claims they have science to back up their belief in God. Utterly stupid. Most scientists admit that the universe is fine tuned for life. In addition, we now have the evidence from DNA which suggests that billions of sequentially arranged genes could not be tyhe product of chance and natural selection. Most scientist agree that our universe shows evidence of fine tuning, and we have the additional evidence from the extremely complex arrangement of the DNA, and you seem to argue that there is no evidence for a Designer? Do you really believe that the information contained in the human DNA is the result of chance and natural selection? What is the probability of this having evolved without the intervention of intelligent activity? Some years ago, Dr. Collins, the man in charge of the human genome project, said the following in his speech during a graduation ceremony at Loma Linda University: I was tempted to read to you the entire DNA sequence, but I changed my mind when I discovered that it would take me 32 years of non-stop reading. Jeff, what makes it even more stupid is that you keep doing it over and over; this thread is about the 50th time you’ve engaged in this debate with Sean, even though you know exactly what Sean’s position is, and it hasn’t changed. How can a fideist argue that anything is “utterly stupid”? based on what evidence? Bob&#032Helm: We have more than just the eyewitness accounts. We also have prophecies that were fulfilled in an amazing way, and the writers of the New Testament repeatedly appeal to those prophecies. I agree, and take solace in this, but for most prophecies only an interpretation has been fulfilled. Don’t forget that “spiritual things…are spiritually discerned” (1 Cor 2:13, 14), not validated by rigor of the scientific method. Note also that true science is also “spiritually discerned” as well. All truth is God’s truth. The ability to think rationally, to think scientifically, is a gift of God where we think God’s thoughts after Him – as Newton pointed out. Without the guidance of the Spirit of God, valid science would also be impossible. This isn’t true. If prophecies could be easily interpreted to mean vastly different things, they wouldn’t be useful as a basis for rational faith. It is precisely because they are open to the very real possibility of falsification that they form a very solid evidentiary basis for faith. Biblical prophecies aren’t like the vague lines of Nostradamus, for example. If they were, the Bible’s claims to Divine origin would rightly be suspect. David&#032Read: if you know Jesus and you know that God is real, then obviously you do not do science pursuant to the assumption that God has never intervened in the material world. You do creation science. I believe fully that God has intervened in the material world. But virtually all of God’s original creation and his interventions are, quite simply, beyond science. We cannot falsify supernatural events using the naturalistic approach of science. Moreover, the Church, like you and me, will never accept Sean Pitman’s position that we follow the science rather than inspiration. There has never been, nor ever will be, a smoking gun, magic bullet, or rock with the words “made in heaven” to prove beyond doubt the veracity of Genesis 1. Ultimately, we choose to believe in God and accept Christ’s sacrifice on our behalf regardless of how or when the earth was made, and the evidence that supports it. No, you don’t. If you really believed that, you would do science accordingly. But you don’t. In fact, you do science according to the assumption that God never intervened in the material universe. So I have to assume that that is what you really believe, protestations to the contrary notwithstanding. David, can I say a big AMEN to what you said? You’re asking for absolute demonstration. That’s not science or faith. That’s not going with the “weight of evidence”. God does not offer absolute proof, but the weight of evidence. Ellen White, Letter 19d, 1892, cited in The Ellen G. White 1888 Materials, pp. 1029, 1030. The resurrection of Jesus Christ was the magic bullet. The historical evidence suggests that this is what lead to the implosion of Pagan Rome. The evidence was so strong that millions of Christians chose death rather than deny that Jesus was in fact alive folowing his crucifixion. Do you deny the weight of historical evidence? Science demands absolute proof from religious faith, but cannot provide absolute proof for the its pet theory about origins! Science denies the scientific evidence favoring Intelligent Design in nature. I thought that true science was suppossed to follow the evidence regardless of where it lead the one doing research! Shutting the door to evidencee contrary to its pet paradigm is not what true science is supposed to defend! I have no doubt that Darwinists will attempt to incorporate the new information regarding pseudogenes into their paradigm, although the hardliners in the Darwinian camp are currently busy trying to debunk or explain away the fine work of the ENCODE project. Louis Agassiz was right. Because evolution has a strange hold on the human mind, Darwinists fail to see that they have been chasing a phantom for 150 years. I am glad that you personally affirm Biblical creation, but your wholesale rejection of Christian apologetics disappoints me. Seventh-day Adventism and New Testament Christianity have always rejected the concept of “blind faith.” Consider how the authors of the Gospels repeatedly appeal to prophecy as evidence for Jesus’ Messianic claims. And Paul told King Agrippa that the Christ Event did not occur in a corner. Your concept of “blind faith” and your desire to confine theology and natural science to totally separate, airtight compartments stem, not from the New Testament or from Adventism, but from the 18th century Enlightenment. Tell us about ENCODE in a few sentences. I dont think it shows what you think it does. Certainly the DI CMI ICR take on it is jaundiced. Such statements really make me doubt your credibility and ability to critically evaluate information. You will not at all find any scientist in the field in consternation over ENCODE. Rather they are joyfully incorporating these new observations into models of genomic structure and gene regulation that have existed based on simpler and less complete data for some years now. That is because as I have said before to a scientist unless it is in the peer reviewed literature it doesn’t exist. Lets not get into the argurment that creationist cant publish in the literature. That argument is voided until you can show me the rejection details for you manuscript. Dr. Paul Giem gave a lecture recently dealing with an article which disappeared from the record of peer reviewed literature when the editors discovered that it could be used to support views contrary to the theory of evolution. Well, that’s wrong. It does in fact “exist” for the individual doing the science – like it did for Leonardo da Vinci when he was doing his own science for himself. Science need not exist for anyone else in order for it to exist for the individual and for it to give the individual the right answer – regardless of what anyone else thinks or knows. Its called trade secrets which to most scientists is the most unhelpful of intellectual property as it locks away observation and impedes the progress of knowledge. Blind faith is what the defenders of the theory of evolution are teeaching. Scripture and that of Jesus Christ. I think your are confused. All Christians whatever their understanding of biology have a doctrine of creation. A doctrine of creation does not stand as the antithesis of a theory of evolution; it is actually the antithesis of atheism. The proper comparison of a theory of evolution is a theory of creation. If you want to have a theory of creation you have to define it and test it with the same rigor as the theory of evolution is defined and tested. This comparison is a very one sided comparison when subjected to the same de jure standard of methodological naturalism found in all areas of science. Any dialogue about creation is done a disservice by conflating a theory of creation with a doctrine of creation. How do you test the theory of common descent? How do you rule out the alternative theory of common design? How do you test the theory that nothing could have produced everything? How far can methodological naturalism take us? The problem with evolutionists is that if they can posit one chance in a trillion that life as we know it today is the product of natural selection, they will choose that chance and ignore the trillion chance agaqinst it. Does this make common sense and is it based on logic? The existence of the universe and life in it is conclusive evidence in favor of the theory of creation. Science has no credible explanation for the presence of life and the existence of the universe. The Big Bang is nothing more than philosophical speculation. Singularities are not based on scientific facts and cannot be validated by observation, experimentation or replication, which are the cornerstones of scientific research. Nic&#032Samojluk: How about the fine tuning of the universe which allowed for the appearance of life on our planet? What is this fine tuning evidence of? Specifically what evidence are you speaking of, and how would evolutionism and creationism differ in this regard? You’ve made the bald assertion before that this constitutes scientific evidence for creationism. It’s just a bald assertion based on several fallacies, including the fallacies of argument from ignorance, incomplete comparison, post hoc ergo propter hoc (false cause/effect), and the fallacy of a single cause. Nic&#032Samojluk: Can a Big Bang explosion produce the fine tuning required for the emergence of life? Nic&#032Samojluk: Can a non-entity be responsible for the creation—emergence if you prefer—of everything? Same problem for both evolutionism and creationism. Nic&#032Samojluk: How scientific is such a premise? Your remarks and most everything Sean has to say are nothing more than philosophical arguments, not science. You’re also addressing some basic assumptions of methodological naturalism–assumptions, not science. Nic&#032Samojluk: Is there any evidence for the creation of everything from nothing? You and other creationists believe this, so why are you insisting this is a problem for evolutionism? Both theories are predicated on this assumption. If I may ask, how old are you? Are you a college student? The fine tuning of the universe is evidence of intelligent design. Yet, popular scientists tell me that a big explosion did this and that the Big Bang was preceded by a Singularity. A singularity is not based on science, but rather science fiction. It cannot be verified, tested, nor duplicated. Such an explanation requires more faith than accepting what the Bible teaches: that an Almighty God created a universe fit for life. Popular scientists try to convince me that a non-entity, a Singularity followed by a big explosion, without any need for intelligence of any kind, is responsible for everything that exists . Common sense and logic, which is required for true scientific reasoning, tells me that such an argument is based on a fallacy and philosophical speculation that is not worth a dime! I am 80 years old and I hold a Ph. D. in religion. My doctoral dissertation was on abortion as it relates to the Adventist Church. I don’t think you understand the science or rational arguments behind the detection of an artefact as a true artefact. In fact, I don’t think you understand the basis of science in general. You seem to argue that one needs more information than one really needs before a valid scientific conclusion can be proposed to explain a given phenomenon. The fact is, it simply isn’t true that a scientist needs to know the origin and identity of the designer before the scientist can propose a scientific hypothesis that the artifact in question (a granite cube in this case) is in fact a true artefact – the production of deliberate intelligence and creativity on at least a human level. The same thing is true for the fined tuned features of the universe. Such features can very rationally be explained as true artefacts. Such a hypothesis is most consistent with the information we currently have in hand about the origin of fined tuned features needed for complex machines to work. They just aren’t produced without deliberate intelligence being involved. You argue that such conclusions aren’t “scientific”. If true, you’ve just removed forensic science, anthropology, history in general, and even SETI science from the realm of true fields of scientific study and investigation. Sean&#032Pitman: The process of detecting artefacts as true artefacts is a real science based on prior experience, experimentation, and testing with the potential of future falsification. Oh, and I do happen to own a bona fide polished granite cube. It has the weight of your interpretation of evidence–very little of it “empirical”–to back it up. There’s a big difference, as you well know. Not true. It has a great deal of empirical evidence to back it up – evidence which has general appeal and which is very difficult to honestly interpret any other way. Again, we’re not talking about Nostradamus-like prophecies here. We’re talking about amazingly specific prophecies and other forms of empirical evidence regarding the historical accuracy and authenticity of the Biblical accounts. Your conclusion is based strictly on your interpretation of the evidence–evidence which does not meet the standards of modern science and null hypothesis testing. There are no statistical probabilities. Your insistence on “weight of empirical evidence” is pure hubris. Try selling your strange and unreasonable demands on historical investigation to a real historian. Do you think that you would succeed? I think this is why we have been talking past each other all of these years. You have a very different view of evidence, of empirical evidence, than I do. By default then you also have a very different view of science and the definition and functional basis of science. The fact is that Biblical prophecy is evidence, empirical evidence, with the potential for falsifiability and predictive value – to include a basis in statistical probabilities. In other words, one can actually figure out the odds of all the prophecies about Jesus being randomly fulfilled by sheer luck. Again, this is a rational basis in empirical evidence. It is not “pure hubris” to present people with Biblical prophecy as a very good basis for a rational starting point for solid faith in the claims of the Bible. Sean&#032Pitman: How thin is the credibility of the Bible established? Through historical evidence, to include fulfilled prophecies, the willingness of all of the disciples to put their lives on the line for their story, and the fact that no one countered the testimony of the disciples regarding the empty tomb. These do not equate to “potentially falsifiable empirical evidence.” None of this is “scientific.” Fulfilled prophecies, for example, are merely fulfilled interpretations of prophecies. There’s no problem accepting these things and labeling them as evidence, but none of these remotely resemble the level of evidence you insist your faith is based on. You cannot falsify any of these items. Sean&#032Pitman: I’d say that’s far far better evidence than any alien or Big Foot encounter story… at least for anyone who is actually looking for the Truth. This is based on your interpretation of the evidence, not the evidence itself. Sean&#032Pitman: Of course there are those who will reject this evidence – obviously. However, there were those in Jesus’ day who would reject the Truth even though they themselves saw Him raise Lazarus from the dead. For such people, the weight of evidence isn’t the answer. They love their lies so much that they won’t change their minds regardless of the evidence presented – they actually want to be deceived. For such, there is no hope – nothing further God can do. Most people who reject God and Scripture do not love lies. They use YOUR approach: they use their God-given brains and rely on the most compelling evidence available to them, evidence they interpret in a very different way than you do. Let’s get something straight. Your claim to possessing superior beliefs because they are based on science and rational thinking are based entirely on interpretation rather than empirical evidence. Your claims are vacuous. You should boast less. Your claim is only partially true. The resurrection of Jesus is not subject to scientific falsification today, but said event was potentially falsifiable by the contemporaries of Jesus Christ. All they needed to do was to produce the dead body of Jesus. They didn’t even try because the evidence was so overwhelming. The same can be said about Lazarus. There was a large number of individuals, including Jewish leaders, who had witnessed how this man came out of the tomb on the fourth day after being buried there. The scientific evidence was so impressive that in a few centuries the entire pagan Roman empire collapsed under the weight of what the wisest men of the time could not deny. The followers of Jesus were so impressed with these facts that they were willing to give their lives for this undeniable belief. Actually, this does qualify as empirical evidence today – since these events were so very well documented (to include the fact that Jesus’ body could not be found by His enemies). The historical sciences are very very clear in this regard. Sean Pitman: How then is the credibility of the Bible established? Through historical evidence, to include fulfilled prophecies, the willingness of all of the disciples to put their lives on the line for their story, and the fact that no one countered the testimony of the disciples regarding the empty tomb. Yes they do. They are statements about historical events that can be investigated and potentially falsify? Did the disciples in fact put their lives on the line for their story? That question is potentially falsifiable. Did the enemies of Jesus even try to counter the claim that Jesus’ tomb was empty? That also is a potentially falsifiable claim. That is empirical evidence. None of this is “scientific.” Fulfilled prophecies, for example, are merely fulfilled interpretations of prophecies. Interpretations. There’s no problem accepting these things and labeling them as evidence, but none of these remotely resemble the level of evidence you insist your faith is based on. You cannot falsify any of these items. Again, not true. Everything is an “interpretation” Jeff. Many of the prophecies are too specific to be rationally “interpreted” any other way than in their fulfillment in Jesus birth, life, and death. The prophecies can be effectively falsified if Jesus didn’t do what they claimed He did when He actually lived and died. This is very good empirical evidence. In fact, it is extraordinary empirical evidence. All evidence must be interpreted in science. Otherwise, all scientists would agree all the time. That’s just not the case. This does not mean that the Biblical prophecies are “evidence” – they are evidence. They are fantastic empirical evidence in support of the Biblical claims for Divine origin. Sean Pitman: I’d say that’s far far better evidence than any alien or Big Foot encounter story… at least for anyone who is actually looking for the Truth. What is evidence without interpretation? Nothing. However, for those willing to consider Biblical prophecy with a candid mind, the evidence they offer, the empirical evidence, is very clear – the interpretation is obvious based on the historical evidence. Sean Pitman: Of course there are those who will reject this evidence – obviously. However, there were those in Jesus’ day who would reject the Truth even though they themselves saw Him raise Lazarus from the dead. For such people, the weight of evidence isn’t the answer. They love their lies so much that they won’t change their minds regardless of the evidence presented – they actually want to be deceived. For such, there is no hope – nothing further God can do. Beyond this, only God knows the heart of a person – to include the mental capabilities given. That is why this is not an issue of salvation per se. Will honestly confused people who never understood the Divine origin of the Bible or the literal nature of the Genesis account be in Heaven? To be sure! However, this does not discount the fact that learning the truth about these things here in this life comes with great rewards here and now. The fact is that observations are meaningless until they are interpreted. The question is, does the interpretation make rational sense? Does it match the hypothesis in a meaningful way? That’s science. This is not what I have been reading in the news. Worshiping Natural Selection instead of the One who created heaven and earth is in direct opposition to the last message for the world found in thee book of Revelation. David&#032Read: You say, or at least imply, that God makes extraordinary claims, but why do YOU find God’s revealed truth more to be more “extraordinary”, i.e., hard to believe, than the speculations of finite humans? The answer, of course, is that such is the culture of science, as well as your own professional acculturation, since you are a scientist. That doesn’t surprise me in the slightest. What does surprise me a little bit is your seeming lack of awareness of how greatly that culture conflicts with a biblical worldview. God in scripture makes extraordinary claims. Evolutionism makes extraordinary claims. If the evidence was as strong to support either set of claims as the most vocal advocates of either side claimed, we wouldn’t have this discussion, much less Educate Truth. Virtually everyone would be in agreement. The simple reality is that extraordinary evidence is lacking for both sets of claims. Honest people, kncluding scientists, acknowledge that accepting either set of claims (and I unabashedly accept God’s claims) is based largely on faith. You yourself have acknowledged this. When did culture enter this conversation? What exactly do you think I think about culture and evolution? Jeff, I could not possibly agree more. And since you acknowledge that both views are based upon faith, I must ask you again why you do apologetics for the adversary’s faith, instead of for what you claim is your own faith? Because that’s what your doing. When you do mainstream origins science, you are essentially arguing for the view that God has never intervened in the material universe. When you do creation science, you’re doing biblical apologetics. You have acknowledged that both views are equally faith-based, and yet you continue to do apologetics for a faith that you claim is the opposite of your own faith. Why? This is where you–and many other similarly situated confessed Christians–are fooling yourselves. You think it is somehow okay for you to claim that you believe in a Creator God, while at the same time devoting your professional lives to building up an edifice of evidence and argument designed to show that the world is accidentally self-created. Why do you think that is okay? Why do you think that devoting your career to arguing against the meaningful existence of a Creator God is an appropriate way to serve God? The obvious answer is, “hey, I’m a scientist, this is how science is done, and I have to make a living.” But the rich irony of that particular cop out in your particular case is that there would be plenty of positions for creation scientists if only the colleges affiliated with creationist denominations would stay true to their denominational mission. And yet, on this site, you have obsessively defended La Sierra for its betrayal of its denominational mission; La Sierra has stocked its paying science positions with atheistic apologists instead of biblical apologists, and you constantly, obsessively argue that it is somehow doing the right thing. That is what I call irony. Precisely! Those defending theistic evolution and methodological naturalism while pretending to remain faithful to the Bible are deceiving themselves. True scientists have a great advantage over those limiting their research to natural events. True scientists take into consideration all evidence available to us–including natural and supernatural evidence. The historical evidence recorded in the Bible provides the basis of our reliance on the power of God over nature and even over death itself. This was the mission of Jesus Christ. Scientist who dismiss the historical evidence provided by Jesus are a bunch of fools who are fooling the entire world. Those in charge of La Sierra Univesity have fallen into this trap which was designed in hell. The theory of evoloution is a clever design of Satan whose objective is to lead humans to the worship of Nature instead of Almighty Creator. It is high time for the church to divest itself from this institution. There is no need for a acrimonious fight. This could be accomplished through a friendly divorce. This institution can function idependently from the General Conference like the Quiet Hour, 3ABN and many other independent ministries. LSU loves freeddom. Let them have it! LSU has been destroying the faith of their students in the most fundamental doctrine of the Christian faith: the doctrine of creation. The last message to the world is a call to worship the One who created heaven and earth and the fountains of waters. This is our mission–not the teaching of evolution as the best explanation for origin! Nic, I appreciate your core summary of the views that Sean, and David and other are expressing. I am new coming here with a bible based perspective that does resonate with what you have said. My only disagreement probably is that I am not sure that a divorce of the Church from LSU is going to be the best approach in the long term. I think there must be some way for bringing unity within the church short of simply chopping off institutions. I think we can trust Ted Wilson to help reformation in the schools. After all I do think the church should have loyal educational institutions to train its people. This site should be at the forefront in strategies to do that. I meant a friendly divorce like when a parent grants his/her grown up child its independence and cuts the emotional and physical umbilical chord. I do trust his intentions; what I am not so sure is about his ability to effect such a major transformation. The doctrine of long ages bug has infiltrated so deep into the biology and the religion departments that only a miracle would be able to bring said school back to the Adventist fold. We do need Adventist schools, but when an institution persistently departs from a doctrine so foundational to Adventism like Creation, the educational entity has crossed the line and must be given its freedom to go its own way. It is hard for a parent to let a son or daughter assert its independence, but in every case the time comes when this must be done. The same is true about fiercely independent shools that value their freedom more than their loyalty to the parent entity that has given them their life. La Sierra University can function on its own without its dependence on the GC. It is high time to cut the umbilical chord. If the school is so enamored with Darwinian evolution, let them experiment on their own dime. This never ending controversy between LSU and the church is not healthy to the parties. Let them function independently like 3ABN, The Quiet Hour, Adventist Today, Advindicate, and many other similar organizations. But I don’t want to divorce her. I want to cure her. You can’t legally impose a medical procedure on an unwilling patient. You must seek the patient’s consent. This has been tried and failed. The church must learn from the father of the Prodigal Son. He granted his wayward son his independence and gave him his inheritance in spite of the risk that was involved in doing so. There really is no debate in the rest of the scientific world outside of adventism. It ended in 1869 at Cambridge university when Huxley presented the theory to the scientific establishment. Adventists are stuck between obstruction and irrelivance on this topic. That’s not entirely true. Many people do not make decisions based on the weight of evidence. As Jesus pointed out, some people will not accept certain realities even if someone were to be “raised from the dead” as a demonstration. They simply love their lie too much to let it go. It’s more a matter of desire than of evidence for many. Remember, this isn’t about absolute demonstration, but about the weight of evidence that you, as an individual, have been given to rationally understand. Sean&#032Pitman: You’re asking for absolute demonstration. That’s not science or faith. That’s not going with the “weight of evidence”. God does not offer absolute proof, but the weight of evidence. No I’m not. I’m pointing out how ridiculous it is to demand that only one side makes extraordinary claims and is therefore required to produce extraordinary evidence. I agree, the weight of evidence favors the believers in creation. I say a big AMEN to this! Don’t be absurd. I have never advocated blind faith. Recognizing the error in much of apologetics does not equate to blind faith. Twisting every fact to fit a theory about a supernatural event that cannot be duplicated by the naturalistic approach of science is simply misinformed belief based on a fragile faith devoid of the surety one has when in a personal relationship with Jesus. Get on your knees and look toward heaven. You won’t find God by digging up dirt. Blind faith is defined, for most people anyway, as a type of faith that exists independent of the need for support from empirical evidence or a rational basis. That is exactly the type of faith you’ve always argued for – empirically blind faith. You say that faith can have evidentiary support, but that such support is not required. That’s the definition of fideism. Exactly Sean and that is exactly a description of the the faith you manifest in the canonical text and the the writings of EG White. They cannot be scrutinized by any rational method that will yield empirical evidence since to do so is by definition higher criticism and that is forbidden. The basis of my faith can be scrutinized by rational methodologies and is open to the potential for falsification. Your faith, on the other hand, cannot be rationally scrutinized and is therefore not open to even the potential for falsification. What is also interesting is that the fideists in this forum (you and Jeff Kent) have faiths that do not agree with each other. God is evidently telling you guys different things about reality… and neither one of you can change your faith based on any kind of argument or evidence presented because your faith has no rational basis – because faith, according to you guys, trumps human reasoning. Yes, blind faith is the willingness to trust someone’s claim without the need for evidence that such a person’s claims can be relied on. Paul said that Abraham believed and that he was justified on the basis of faith. Yet, when I go to Genesis, I discover that such a declaration is found in chapter 15 instead of chapter 12. My estimate is that about ten years elapsed between the time God called Abraham and chapter 15 when he was justified on the basis of faith. Between chapter 12 and chapter 15 there was a religious experience which convinced Abraham that God could be trusted. This was not a blind faith, but a faith based on the weight of evidence. Besides, Abraham probably inherited some faith from a long line of ancestors who worshipped the true God going back all the way to Adam and Eve. His was not a blind faith, but rather a faith based on evidence. But twisting every fact to fit a naturalistic theory is okay? Because that’s exactly what mainstream science does. For example, everything in human existence, absolutely without exception, shows that you never get a code without a codemaker. You never get music without a musician, writing without a writer, computer code without a programmer, etc. Yet mainstream science insists that we got the genetic code, which is more complex than all of the foregoing, without a designer. That’s what I call “twisting every fact to fit” into science’s philosophy of naturalism. Why is it okay for mainstream science to twist facts to fit its theories but not for creationist to construe and interpret the data of nature in accordance with revealed truth? God wants you to be fully converted, in both heart and mind. And it doesn’t matter which is converted first. Some people have a heart experience that eventually results in them changing their views on origins, while others see design in nature and it leads them to the God of nature. Either is okay. But you seem to be “halting between two opinions.” You believe in God and have a relationship with Christ, but that relationship has not converted your mind or your approach to your profession. You insist on doing your scientific work in a way that effectively denies what you claim to believe. It would be too rude to say you lack integrity, but clearly your Christian beliefs are not integrated with your work life; there is no integration between your faith and your work. You have expressed my views on this issue in a crystal clear manner. How can some Adventists be blind to such clear logic? How do you explain the fact thaqt Jesus took such pains to provide physical evidence of his supernatural power over nature, disease, and even over death? If all we need is to get on our knees and pray instead of digging dirt, why did he spend three years providing convincing evidence that he was indeed what he claimed to be? You are dismissing the evidence which convinced Jesus disciples to choose death rather than denying the evidence they had witnessed for three year about the supernatural power of the one who claimed to be the Son of God. He devoted his entire ministry in his effort to convince his followers that he was the one who he claimed to be by means of supernatural acts. Well pahd, let me give it another kick at the cat. I don’t know and this is why. Are there any forces of nature that could have caused such an object to appear the way it did? Ever see a perfectly rounded pebble made smooth by the actions of the sea? If an alien landed on earth and didn’t understand the actions of the ocean upon rocks, the alien might wrongly assume such a highly symmetrical object was of intelligent and deliberate design? This would especially be the case it on its planet if such aliens manufactured smooth symmetrical rocks. Thus if the alien’s frame of reference was only its own and it tried to superimpose such understanding upon a force of nature the alien would conclude wrong. The problem with ID is that it superimposes human understanding of design upon hypothetical aliens or supernatural entitie(s) that may have totally different design criteria. Can Man really judge the hypothetical design of the universe by a god based on human standards of design. I sure wouldn’t have designed the universe the way I see it, but then again I’m not a god. If random probability produced our universe as one of many, with a set of laws that allowed for the anthropic principle to prevail, such design may not be fathomable….yet. As I originally pointed out, this means that it is impossible for you to detect, or at least admit that it is at least theoretically possible to detected, design behind any phenomenon outside of this planet… contrary to SETI scientists and the vast majority of other scientists who would in fact recognize a highly symmetrical polished granite cube as a true artefact of intelligent design – even if found on an alien planet. Such a discovery would hit the front page of every news paper and science journal in the world – and for very good reason. Spherical formations are much more “natural” than are perfect cubes when it comes to the material of granite – don’t you know? The fact that you refuse to recognize such arguments as rational given the information that is currently in hand simply means that you’ve made up your mind independent of any and all evidence that could possibly be presented. Such is not a rational scientific position on your part. Such is a philosophical or even religious position that is dogmatic and unshakable. You seem to have a popular, but mistaken, notion that if something is not definitively provable, 100%, then it’s not scientific. That’s just wrong. All scientific theories are potentially falsifiable given additional discoveries. So, just because a theory has the potential to be wrong doesn’t mean it isn’t scientific or that it isn’t the most rational conclusion given what is currently known. Nic&#032Samojluk: If a researcher starts with the conviction that there is no such thing as a designer, then he will dismiss all evidence to the contrary. Closing the door to evidence contrary to one’s set position is a violation of true scientific inquiry. Evolutionists believe there is a designer, and that it’s a random process rather than a supernatural being. True scientific inquiry simply cannot confirm or rule out the existence of a supernatural designer. True scientific inquiry simply cannot turn back the clock, replay history, and test exactly how life was created. Even if it could find a way in which it could have happend, one cannot conclude it has to be the way it happened. By the way, I’m quite certain you’ve completely closed the door to one position, so why are you lecturing me on what constitutes true science? That’s nonsense. Design implies teleology, intent, and purpose, all of which evolutionists deny a priori. Evolutionists officially believe that the world and its life forms did not require a designer but arose from random processes. And, frankly, whenever the Darwinists use teleological language like “design” and “designer,” we should call them on it and force them to use language that reflects what they officially purport to believe. Yes! True evolutionists believe that nothing produced everything. If the input is nothing, the output will out of necessity be nothing—not the most complex universe and the most complex DNA sequence. This basic principle is so basic that I marvel how the most influential scientists accept the evolutionist nonsense and defend it as if it were the sacred Gospel. Evidently, someone is behind this the most sophisticated deception, and we know his identity. He is the one who dared to challenge God Almighty’s authority. There are many things science cannot rule out. Science cannot rule out the possibility that the universe could explode tomorrow, or that the earth will stop spinning. The probability of something like this would take place tomorrow is so small that we can dismiss them for practical reasons. When my first son was born, I knew that I had not designed him with my wisdom and when I learned about how complex is the human DNA, and how complex is our universe, the evidence that those things are the result of natural selection became so small that on the weight of evidence I had to admit the some highly intelligent force was responsible for them. You can add the Cambrian Explosion, which suggests intelligent design as well instead of the result of a natural explosion, and the origin of the universe and life in it. I conclude that for me to believe that the Big Bang did this is evidence of an obtuse mind determined to hold to what is extremely impossible. For me the theory of the Big Bang is a monument to the stupidity of those who try to give credit that belongs to Almighty God to the pagan god of Nature. It is idolatry pure and simple, and an affront to the Creator. Evolutionists believe there is a designer, and that it’s a random process rather than a supernatural being. True scientific inquiry simply cannot confirm or rule out the existence of a supernatural designer. True scientific inquiry simply cannot turn back the clock, replay history, and test exactly how life was created. If one could turn back the clock and replay history and see exactly how life was created, that would be demonstration, not science. Again, you have this very mistaken view of science as something akin to absolute demonstration or fact. That’s not science. Science is where limited information is taken and used to hypothesize or predict something that cannot be absolutely demonstrated or known with perfect assurance. Science is therefore always open to the potential of falsification, of being wrong. I’ve explained this to you so many times. Surely you know this by now, so why do you keep asking for absolute demonstrations instead of the weight of evidence? – instead of real science? Even if [one] could find a way in which it could have happend, one cannot conclude it has to be the way it happened. That’s not what I said – and you know it. What I said was that science can detect design – even very high-level intelligent design. Most, even among secular scientists, would agree that it is an obvious truism that if God did actually exist and if God decided to act in a manner detectable as “intelligent” by science, that science could in fact detect those particular actions as requiring deliberate intelligence. God, if He exists, is most certainly is no less capable of producing a radio signal or a highly symmetrical granite cube or a space craft than is some alien or even human-level intelligence. As another hypothetical example, say you had one of the loaves of bread that Jesus miraculously made to feed a large crowd. Would you be able to tell that your loaf of bread was in fact produced by a Divine miracle just by looking at it and examining it carefully? Of course not. However, you would most certainly be able to tell that it was the product of intelligent design. The same is true of various artifacts found within living things – to include higher level functional information stored within the DNA of all living things. Your repeated requirement for absolute demonstrations to support such conclusions simply isn’t part of science – as you should known since you claim to be a scientist. @Bob, you have expressed my views with masterful precision. Can I hire you as my spokesperson? Oh, so you believe in limited ID as an explanation for certain artifacts?I certainly believe in very limited, but speedy, forms of Darwinian style evolution – that’s quite true.Likewise, you believe that human-type intelligence can be detected behind various artifacts, even on alien planets, as long as one is limited to proposing that the intelligent agent has a physical brain?That is what you’ve been arguing here – correct? Why dont you just identify yourself as what you really are a neo-darwinist and follower of Provine? Be consistent in your argument Sean. I do not want to be saddled with the baggage of neo-Darwinism, Provine style Atheism nor ID. You do not want to be a neo-Darwinist. I do not think you are a neo-Darwinist any more than I think I am an ID supporter. Fair enough. How about you be more precise and recognize the arguments rather than simply the intellectually lazy ploy of using categories whether they fit or not. Forget the politics associated with the term “Intelligent Design”. Just think about the words themselves. Do you believe that certain artefacts are clearly the product of deliberate intelligent design on at least the human level? You said that you do. You might not support the ability to determine anything else about the designer from a granite cube alone, but you do believe that such a cube is evidence of deliberate intelligence. What term, then, would you like to use to refer to this concept? If you don’t like the term “ID” what term would you use? Sean&#032Pitman: I don’t think you understand the science or rational arguments behind the detection of an artefact as a true artefact. In fact, I don’t think you understand the basis of science in general. Sean&#032Pitman: You argue that such conclusions aren’t “scientific”. If true, you’ve just removed forensic science, anthropology, history in general, and even SETI science from the realm of true fields of scientific study and investigation. Determining that an artefact is a true artefact is hardly “philosophy” any more than science itself is based on philosophical assumptions. The process of detecting artefacts as true artefacts is a real science based on prior experience, experimentation, and testing with the potential of future falsification. Oh, and I do happen to own a bona fide polished granite cube. It is a valid question of science to ask if such a cube would be recognizable as a true artefact regardless of where it happened to be found in the universe? The clear answer to that question is – Yes. This answer is not based on mere philosophy, but is empirically based. It is testable and potentially falsifiable. After all, scientific hypotheses are supposed to have universal application. The assumption is that whatever holds true here holds true everywhere. All of these sciences that propose to detect true artefacts must distinguish between human design and the production of pseudo-artefacts by the “raw” mindless forces of nature. These very same scientific arguments can also be used to detect true artefacts anywhere in the universe – even if humans were never in the area being investigated before. At least human-level creativity is in fact rationally detectable by these scientific methodologies. The question is not if one will catch a fish, but if one will recognize a fish as a fish if one ever did catch a fish. That’s the scientific question here. And, yet again, the clear answer to this question is – Yes. Science can detect at least human level intelligent activity behind various artefacts – regardless of where they might be discovered in the universe. That is why SETI is a valid scientific effort – even if they never find what they’re looking for (which I don’t think they will). Again, it’s not if Santa will come down the chimney, but if one would be able to recognize Santa if he did happen to come down the chimney. Those are two very different questions. The ability to recognize something as an artefact, if it were ever found, is a scientific question that can be established by empirical evidence – even if the actual artefact is never found in a particular location. Bob&#032Helm: How does the virgin birth defy all evidence known to science when science has achieved virgin births with clones? First off, science can’t confirm whether an individual born 2000+ years ago was conceived without human sperm. Second, naturalistic science can’t demonstrate parthenogenesis in mammals without supernatural intercession or the modern technology essential for it to be accomplished today. What is wrong with conceding that many claims of scripture can only be accepted on faith? That science simply cannot examine supernatural events? What is wrong with you people? Where did your faithophobia come from? It’s laughable. Again, for the umpteenth time, while many Biblical stories cannot be directly evaluated, they can be rationally supported by evaluating those elements connected with these stories that can be empirically evaluated – such as the lives of the disciples who told the stories and the fact that they put up their own blood as collateral. Also, the prophecies themselves that refer to these stories can be evaluated for their own predictive value. I believe that this is a misrepresentation of Pitman’s beliefs. My understanding is that he teaches that there is no contradiction between what nature teaches and biblical Revelation. Yes, but if they reveal their intent to discredit the theory of evolution, then the door is closed to the publication of the material.